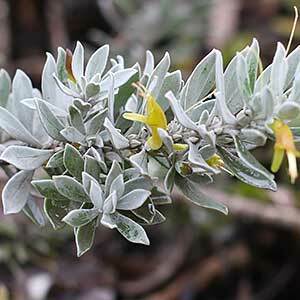 Variable in growth habit and flower colour, Eremophila glabra is commonly called the Tar Bush. Foliage is usually of a grey green colour and flowers from Yellow to Orange. The variety Eremophila glabra subsp. tomentosa is a favourite, attractive grey green foliage with good deep orange to red flowers. It will reach around 1.5 metres in height and is a haven for nectar seeking birds. Eremophila glabra ‘Kalbarri Carpet’ is a low growing form as the name suggests, reaching only around 20 cm in height and with yellow flowers. Again a magnet for Bees, Butterflies and Birds. Eremophila Glabra Roseworthy has foliage more on the green side, it is easier to grow than some others, Orange to red flowers low growing to around .5 metre and spreading to 1.5 metres. Eremophila glabra prostrate form. This is one of the best ground cover forms. A natural dense habit, blue grey foliage and well suited for growing as a low border in a sunny position and a in a well drained soil. Although varieties do differ, general care instructions are similar, the following is a guide line. Choose a well drained soil, or mound up the soil to improve drainage. Spread – Variable from 1 metre to 2 metres. Flowers – Vary from Yellow to Orange and Brown. Flowering time – Autumn to Summer. Foliage – Lanceolate and with fine hairs.